A few months later, curator Donald Brewer selected Reilly’s work for The Reality of Illusion exhibition that traveled to major museums throughout the United States. By 1980 Reilly’s work was represented in galleries across the United States, including Arron Berman Gallery in New York City, Foster Goldstrom Fine Arts in San Francisco, and Marilyn Butler Gallery in Scottsdale. Articles and reviews on Reilly’s work were subsequently published in periodicals such as Arts Magazine, Artweek, Los Angeles Times, Los Angeles Magazine and books including Inside the L.A. Artist and American Art Now. While working in Arizona on a National Endowment for the Arts funded position as artist-in-residence, Reilly received an Arizona Commission on the Arts grant that funded a traveling one-person exhibition of his paintings to museums and university galleries throughout the southwest. From 1985 through 1986 and he was an instructor at Otis Institute of Art and Design in Los Angeles, and in 1987 he joined the faculty at California State University, Northridge. Reilly exhibited his Classic Series in 1989 in a solo exhibition at Boritzer-Gray Gallery in Santa Monica, followed by his Endangered Landscape Series in 1991 at the Sherry Frumkin Gallery in Santa Monica. Throughout the 1990s his artwork expanded beyond painting into experimental film, video and computer generated imagery. During his tenure as professor of art at CSUN, his artistic explorations led to his development of the video/digital art area of concentration. In 2000 he was the featured art expert on the Discovery Television Network program In Pursuit of the Shroud. 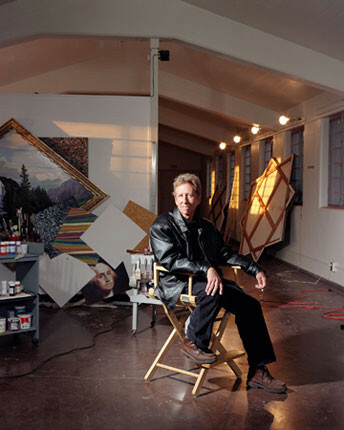 In the fall of 2001 Reilly was hired as professor of fine arts and established the first art faculty at California State University, Channel Islands. His work entitled Fusion Series is an ambitious exploration of painting. These mixed-media works combine various media and techniques including oil, acrylic, metal leaf, cast latex, mosaics, and other unconventional materials on complex shaped canvas structures. A retrospective exhibition of Reilly’s work was featured in fall 2002 at the Studio Channel Islands Art Center located on the campus of CSUCI. Jack Reilly is a recipient of a National Endowment for the Arts grant and numerous awards for his work in painting and experimental video. His artwork is included in major public and private collections internationally, including the Steve Martin Collection and the Fredrick Weisman Foundation. He has executed major commissions for the County of San Diego’s Public Arts Program and American Airlines at Los Angeles International Airport. His work is exhibited in galleries and museums throughout the world. Jack Reilly’s documentation took place in 2002. The FOTM Archive contains extensive information about this artist.